Dr. Eric DiMartino, Dr. Angela DiMartino and Dr. Crystal Loggins are licensed Chiropractors serving the Chesterfield community. They are committed to promoting optimal health and well being with their patients. They use a "whole person approach". This approach to wellness means looking for underlying causes of any disturbance or disruption (which may or may not be causing symptoms at the time) and make whatever interventions and lifestyle adjustments that would optimize the conditions for normal function. Using this unique approach, the doctors are able to help you accelerate and/or maintain your journey to good health. 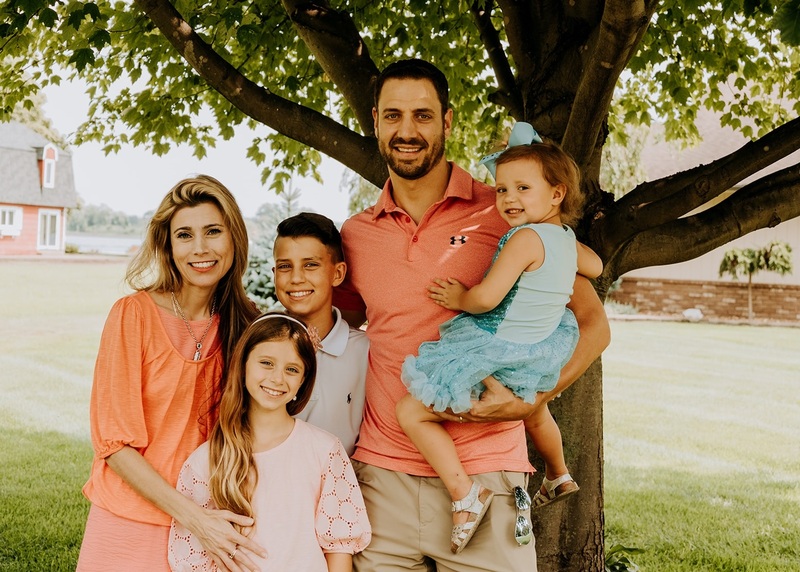 Dr. Eric DiMartino grew up in Bellefonte, PA and went on to receive his Bachelors of Science in Human Biology at The University of Pittsburgh in Pittsburgh, PA. Dr. Eric received his Doctorate of Chiropractic from Palmer College of Chiropractic in Davenport, Iowa in 2002. He currently serves on the Board of Directors for the Michigan Association of Chiropractors (MAC) and has previously served as the President, Vice President and Treasurer of the MAC District 2. He also serves on the MAC Public Relations committee whose goal is to educate the public in matters of chiropractic health and wellness and was also named Chiropractor of the Year in 2017. Dr. Eric regularly donates his time to the community by participating in career fairs at local schools, promoting community health fairs and being an active member of the Anchor Bay Chamber of Commerce. He also regularly performs community health workshops on topics such as spinal health, nutrition, colds and flus, exercise, vaccinations, arthritis and stress management. In his free time Dr. Eric enjoys golfing, reading and playing with his 3 children; Aiden, Giavanna and Sophia. Dr. Angela DiMartino grew up in New Baltimore, Michigan, where she attended Anchor Bay High School. She went on to get her Bachelors of Science in Human Biology at Michigan State University. Dr. Angela received her Doctorate of Chiropractic from Palmer College of Chiropractic in Davenport, Iowa in 2002. She donates her time to the community by teaching students about health at the Anchor Bay, Richmond, Algonac, and New Haven School districts. Dr. Angela also works along with the local Fire/Police Departments charity events, the women's shelter in Mt. Clemens and has been a board member on the Anchor Bay Chamber of Commerce. She gives educational dinner seminars covering topics such as: Balancing Your Hormones Naturally, ADHD, Work Safety On The Job, Nutrition, Being A Raw Vegan, Pediatric/Geriatric and Vaccine Awareness. Dr. Eric and Dr. Angela are parents to Aiden, Giavanna and Sophia. The children can be found playing and running around the office. They have received chiropractic care since birth, being checked only minutes after being born. They are living examples of perfect health through breastfeeding, proper diet, a healthy nervous system and a lot of love. Dr. Crystal Loggins grew up in New Baltimore where she attended Anchor Bay High School and graduated in 2003. She continued her education at Western Michigan University where she majored in pre-medicine but was uncertain which specialty of health care she wanted to pursue. She discovered the importance of chiropractic care after becoming very ill during college. Her illness persisted for weeks regardless of all the medications she was prescribed. Her condition progressed to the point where a tonsillectomy was suggested. She refused and returned home to receive chiropractic care from her sister, Dr. Angela. By the time she returned to school 3 days later she was completely recovered. This experience inspired Dr. Crystal to become a chiropractor. After her first year at Western Michigan she moved to Marietta, GA to attend Life University where she received her Bachelors of Science degree and her Doctorate of Chiropractic degree. While at school she met her fiance, Dr. Keith Guthrie and they had a beautiful daughter named Priscilla. Priscilla has been adjusted regularly since she was 5 hours old. In October of 2016 they had a beautiful son named Kellen Joseph. Dr. Loggins is eager to continue her career at DiMartino Chiropractic Center and serve the Anchor Bay Community. As a three sport High School athlete Dr. Steve quickly realized the importance and benefits of chiropractic care. As a state champion wrestler, he confidently attributes part of his success to routine chiropractic adjustments. He became a D1 athlete at CMU while obtaining degrees in Health Fitness and Exercise Science and then graduated with his Doctorate of Chiropractic from Life University. His decision to pursue a career in chiropractic was a natural choice; regular adjustments were invaluable in his athletic career as well as his daily life. He believes he was called to serve others, to unleash the inborn potential for everyone to be truly healthy through chiropractic. By correcting the root cause of problems, he wants to make a difference in people's lives including those without hope and to improve their lives in performance, function, and purpose! Dr. Steve is a lifelong resident of the area and looks forward to sharing his love of health and wellness with the patients at DiMartino Chiropractic Wellness Center.